Vendable » Blog Archive » When do you block eBay bidders? « Do You Have What It Takes To Get Customers to Enter Your Store? When do you block eBay bidders? •	And you can set a minimum feedback score. 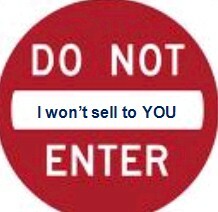 In addition, you can block particular buyers to a blocked bidder list. There are occasions to use each of these (maybe). For example, if you only take payments from PayPal, then maybe you select to stop anyone from bidding who does not have PayPal account (although it may be a new buyer who is going to GET a PayPal account or will be using a Visa card through PayPal). The second “Buyers in Countries to which I don’t ship” seems to be a good use of this feature. You can always add an exception if they are from Spain but are shipping it to Uncle Walter in Utah. Policy violations may be a bit “iffy”. It does depend on the policy violated. If the buyer is also a seller, it’s pretty easy to get a VERO, or other violation along the way. The others are arbitrary and allow you to set conditions. Stopping a bidder from purchasing more if they haven’t paid could be useful. And if a buyer doesn’t have any feedback (are new), you can also block them. (If everyone blocked 0 feedback bidders, it would mean no new buyers ever!). Not a fan of this one (I can, however, understand it). Doing a search for “when do I block a bidder” results in a plethora of pretty strange reasons to stop someone from bidding on your items. (Bidder is a republican/democrat, Creepy User ID, etc. Would love to hear how do you define and set their blocked bidder conditions and if you block individual bidders, why? This entry was posted on Monday, January 11th, 2010 at 11:40 am	and is filed under eBay Marketplace. You can follow any responses to this entry through the RSS 2.0 feed. Both comments and pings are currently closed. I block buyers who leave negative or neutral feedback or those who open a Paypal case or eBay case without contacting me. If their eBay or Paypal claim is reasonable (i.e, they contacted me and warned me that they would open a case for a good reason such as it’s nearly 45 days and they haven’t received their item, or if I screwed up in a way that I shouldn’t) then I won’t block them or I would take them off the block list. Also, in the case of paypal or eBay claims, if they say later they received the item and pay after I’ve issued a refund, then I take them off the block list. I also look for buyers who have left negative or neutral feedback on competitors feedback and pre-emptively block them too. But I exercise discretion, e.g., if a buyer has left 1000 positive feedback and 1 or 2 negative for a competitor whose feedback is, say, 97%, then I wouldn’t block them. But a buyer who habitually leaves negative feedback, especially for a good seller, I pre-emptively block. The lesson? Sellers: Give good service and protect your feedback, Buyers: be responsible with your feedback, eBay: Give sellers *some* recourse with irresponsible buyers. Mind you, I sell niche products with over 800 SKUs for lower priced items. So this works for me, but may not be a good idea for sellers of luxury goods or limited SKUs.